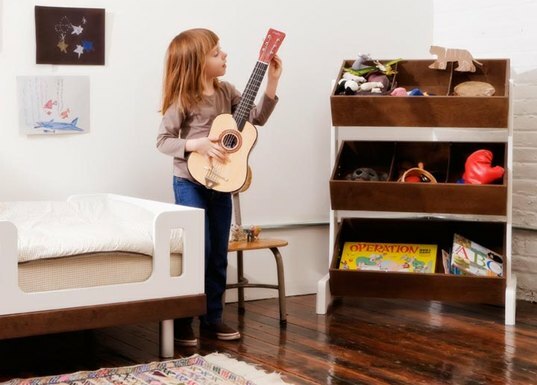 Oeuf‘s Toy Store storage system is an organizational piece of furniture that will grow with your child in function and style, seamlessly adapting to their changing tastes and storage needs. The Toy Store features removable bin dividers that allow kids to showcase toys of varying sizes in an orderly fashion — from small building blocks, to larger stuffed toys, and all the fun stuff in between. Sustainably crafted with Baltic Birch plywood, environmentally friendly MDF made from recovered wood fibers, and a non-toxic, white water-based finish, the Toy Store is available in two color combos: classic walnut or birch finishes with white accents. Oeuf's Toy Store storage system is an organizational piece of furniture that will grow with your child in function and style, seamlessly adapting to their changing tastes and storage needs. The Toy Store features removable bin dividers that allow kids to showcase toys of varying sizes in an orderly fashion -- from small building blocks, to larger stuffed toys, and all the fun stuff� in between. Sustainably crafted with Baltic Birch plywood, environmentally friendly MDF made from recovered wood fibers, and a non-toxic, white water-based finish, the Toy Store is available in two color combos: classic walnut or birch finishes with white accents.